Essential Oils played a huge role in the process of reversing my thyroid disease. They replaced all toxic cleaning, bath/beauty and home products with all natural ones. Not only did I save a lot of money (and target runs) but I felt more in control of what I was using on my body, in my home, and around my family. Read on to find out more about how to choose plants over pills by incorporating essential oils into your home. I am a proud distributor of Young Living Essential Oils. I'll be honest here -- I used to view them as an MLM and wanted absolutely nothing to do with it. But through synchronistic events, I met a chiropractor on the beach near my home and we began talking about all things holistic health. She asked me if I used Young Living in my practice. I told her no, as I already used oils from the department store. I decided to put down my wall, though, and hear her out. 9 months into my relationship with Young Living and the only regret I have is not purchasing my starter kit sooner. I recommend Young Living over any other brand because of their extensive Seed to Seal process. They own the entire process from planting the seed to distilling the oil. I of course asked about pesticides -- turns out they use recycled peppermint oil as a natural pesticide, which we have now started to use in our own garden at home. Who knew! I used to buy cheap oils from department stores until I learned that they only have to be 10% essential oil to legally be sold. So what is the other 90%? Synthetic fillers. On some of the most popular department store brands, It actually says on the label 'Not for Internal Use.' You know the rule: If you can't put it in your body, you shouldn't put it on your body. Every Young Living oil is safe for internal use. 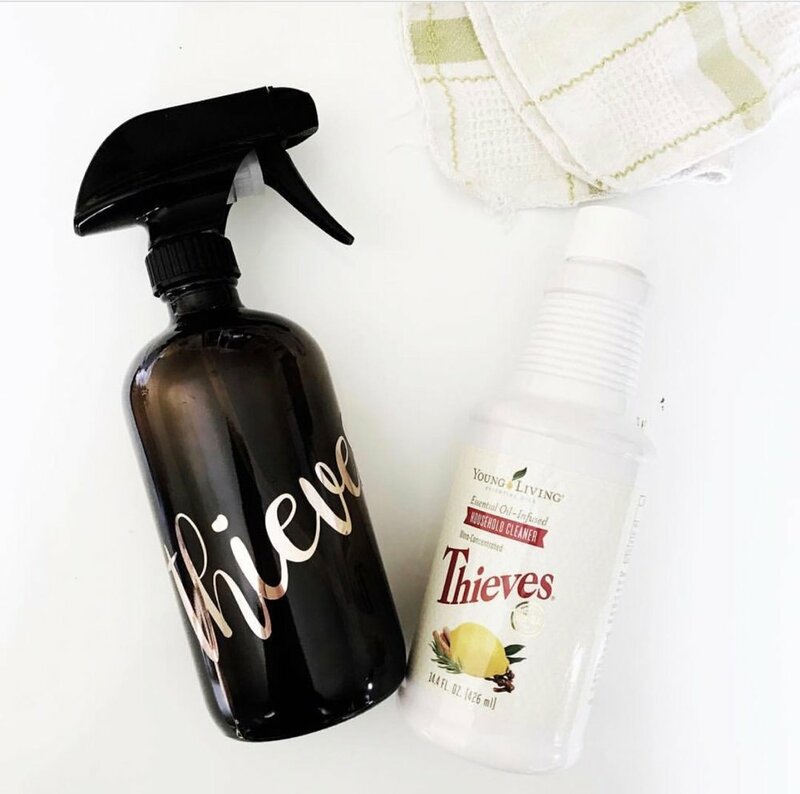 Thieves cleaner is a blend of Clove, Lemon, Rosemary, Cinnamon and Eucalyptus. This one cleaning product replaced everything in my home. Glass, Bathroom, Kitchen, Car, etc. it does it all! Naturally. 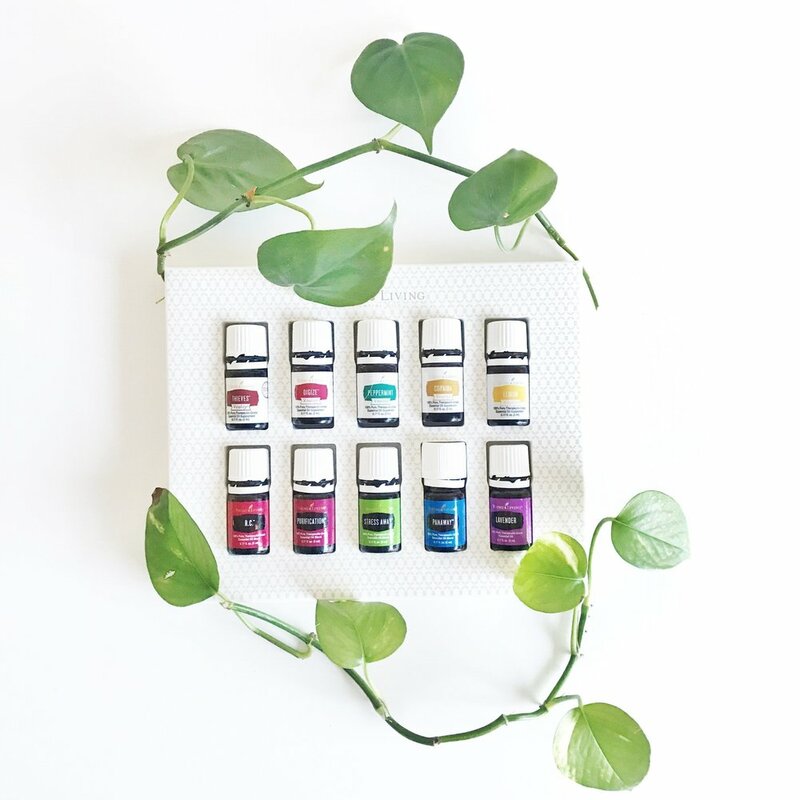 When you order the starter kit, you will receive 11 of the most commonly used oils + a diffuser + a lot of free samples of other products. You also receive direct access to me as your essential oils coach. Once you order your kit, I begin mailing you 1 post card a week highlighting individual oils in your kit. These post cards outline how to use the oil, where to use it, and what it's best used for. I never leave you in the dark! Think you're ready to order? CLICK HERE and follow the instructions. *Any suggestions made on this website are very specific to Young Living essential oils and should not be used with oils from another source. Statements made on this website about Young Living Essential Oils have not been evaluated by the FDA. My sleep blend helps everyone in my family. Relief for sore muscles. Wellness for my hormones. Energy for long road trips! 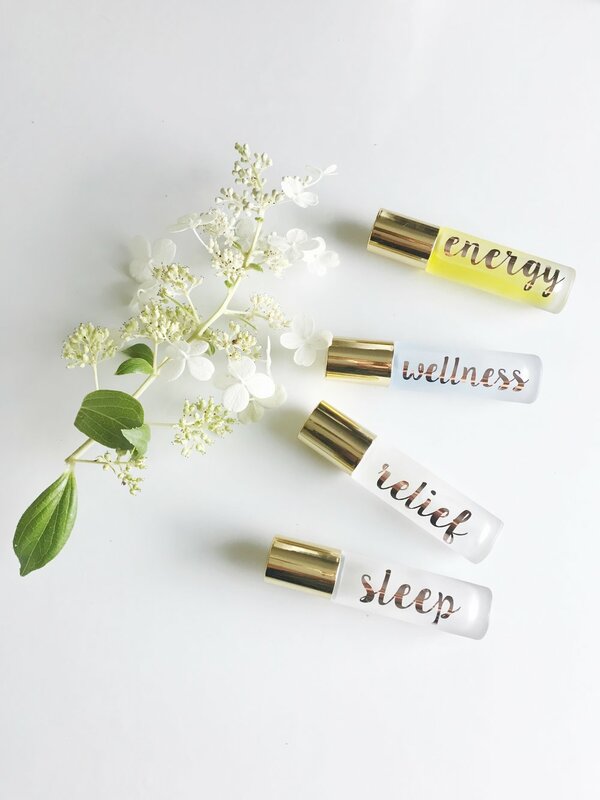 Do I have to sell oils or make monthly purchases? Absolutely not. Your starter kit can be a one time purchase. However, purchasing a starter kit does grant you a wholesale membership which simply means you get 24% off all future purchases, should you decide to order more. For those interested in making Young Living a career, do let me know. I have access to many resources you can use to get your career off the ground and begin helping other families find natural wellness.